The Spanish cuisine is our expertise, at no other restaurant you’ll find Spanish food like at BasQ Kitchen. BasQ Kitchen is Spanish with Basque roots. Our dishes are made with an artisanal method of cooking. Simple dishes that speak for themselves; pure and full of flavors. Nothing is better than the taste of fresh and natural food. Flavors which we all love. Take a bite out of our homemade croquetas, they are made according to authentic Spanish recipes. Our Spanish guests are proud of the high quality of our cuisine. Want to taste the best Spanish tapas and txuleta? You won’t find them anywhere better than at BasQ Kitchen. So, swing by and find out for yourself why BasQ Kitchen is serving you the best Spanish food. Got an appetite for a small bite or want to share and taste different Spanish flavors? Take a look at our tapas / bites for more. During lunch we offer fresh salads, sandwiches and a special selection of tapas tablas. Next to our range of tapas dishes we also offer a few main courses during dinner. Throughout the day we also serve desserts and our special Côte de boeuf (Rubia Gallega) of almost 1000gr. Would you like to plan something special or like to have a group arrangement? Don’t hesitate to contact us. We’re only a phone call or e-mail away. You can reach us on: 010-4140099 (Rotterdam). You can also make a reservation in the agenda on the right. 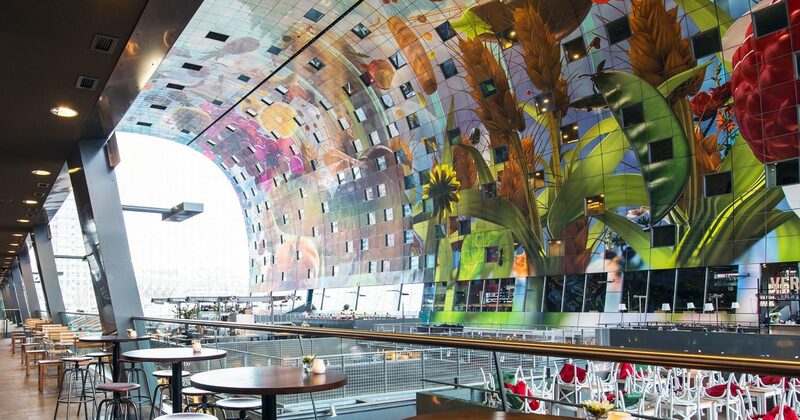 markthal@basqkitchen.nl for our group arrangements. You can also call us to make a reservation. We are looking forward to have you as a guest!